SupportEd conducts literature reviews and provides qualitative as well as quantitative research. In conducting research, we leverage our knowledge of EL education policies and EL demographics, develop a research agenda and methodology, and conduct interviews, a literature review, and research of extant data. We provide insights into complex issues for clients and propose recommendations and solutions. In partnership with the American Institutes for Research (AIR), we collected and analyzed data on district EL reclassification policies and procedures. As part of this project, we interviewed district ESOL directors and reviewed district extant documents. 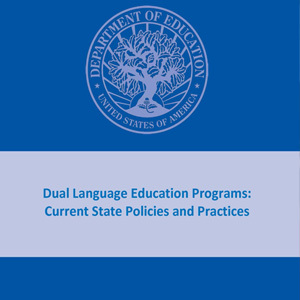 We partnered with AIR to compile and review state data on the policy and practices of dual language education programs. We contributed to the resulting 2016 report (Dual Language Education Programs: Current State Policies and Practices report (2016) by conducting an extensive literature review. We also collected and analyzed data through extant document review and state education agency interviews.